This instructables will show you how to 3D print and assemble your own copy of Mercy's Caduceus Staff from the game Overwatch using printed parts and printer parts (we had a broken inkjet laying around which we salvaged parts from). Mechanical parts were modeled in Autodesk Inventor and Fusion 360. Total development time around 6-7 months. Before you 3D print any of the parts, you'll want to make sure you can acquire the parts necessary to build the staff. -At least 10 magnets 7.5mm diam and 2mm thick, round. Exact size and number not necessary (used to hold batteries together). Once everything else has been gathered together, now it is time to print the parts. You will need approximately 1-2 rolls of 1kg filament (we used PLA but ABS should work just fine) to print the entire staff. I recommend using some sort of white or gray filament as a base, in the event that color shows through the primer (or if you are not painting the staff at all). All files sliced with Cura, with at least 3 shell layers so you don't sand through your model while finishing. Number of top and bottom layers depends on what your printer can handle, but on our Printrbot we used 4 each. It took us around 4 days (96 hours) of printing with our listed settings with 60mm/s. Your mileage may vary. These settings are what worked best for the printer we used (Printrbot Simple Metal). Feel free to use any other settings you deem fit. You know your printer's capabilities. Plan for 4 days (96 hours) of printing with our listed settings. Your mileage may vary. So everything has now been printed, time to gue the parts together. Despite the overall length of this section, it will take a lot of time to get these the way you want them. -Sand the bottoms (if needed) of the handle pieces to be flat/smooth. Insert the 1inch PVC pipe to guide the parts then glue the handle pieces together. -Use table to align rounded sides flat to help glue. A Popsicle stick may also be inserted into small gap to help align the 3 parts. -You can glue the Top Extruder to the Extruder, but for ease of sanding and other finishing, keep separate. -Sand joining surfaces, use pipe to align, glue, fill, sand, etc. -Be careful not to glue to pipe as will be used to add batteries later. Fill gaps using wood filler, then sand flush. Glue Barrel Adapter into top of long barrel. The motor has a keyed section to mount the rod to, but PLA/ABS plastic does not have enough strength to maintain the keyhole. Use the dime (or other strong strip of metal) to fix this problem. -First of all, cut a small strip out of the dime (around 5mm wide) and fit into the flat hole in the side of the shaft adapter. If it doesn't fit, sand/grind it down to meet the size requirements. Glue if necessary. -Grind the side of the drive shaft flat until it fits inside the drive gear that has the dime in place. See "Assemble the SGP" to add dime into drive gear. -Fit the drive shaft (metal rod) into the end of the shaft adapter (large hole in shaft adapter) (hammer into place if tight and glue if necessary). The shaft adapter steps up the 3mm motor shaft to the 6mm drive shaft that goes through the gear box and runs the winglets. -Fit the motor into the motor adapter (friction fit. Be sure terminals are sticking out the other side (side with thinner rectangle). -Cut a small section out from the 3/4in PVC pipe (about 4 inches. Fit may vary) to fit the motor adapter. This 3D printed part has a little "nub" on the side to prevent it from turning. Cut a little space in the PVC pipe for the key to fit into. Cut a section off the other end of the pipe. This is to make space for wires to the motor later. -Test fit the motor adapter into the PVC until the top of the motor is flush with the end of the PVC pipe, with the key of the motor adapter fitting into the space cut into the end of the PVC pipe. If not fitting in completely, sand outside of motor adapter (the printer we used is very very well used, so our prints weren't as precise as designed. You will have varying outcomes). Put aside for later. -Clean up your gears. In our case (cases definitely vary), we had a small glob of plastic on the top of each tooth that needed to be cut off with a hobby knife to ensure enough space for the gears to run together. Folding a piece of sand paper can help get between the gears as well. For some gears (side reactionary gears and shaft reactionary gears), you may need to sand the inside to fit the shafts. Sanding the shafts (especially with the side shafts of the SGP) can work as well to ensure smooth running. -Cut another 5mm wide strip from the dime. -Fit strip into the slot on the bottom of the drive gear. Glue if necessary. Sand bottom flush to ensure smooth running. -Fit the drive gear into the open side of the SGP, lining up the middle hole of the gear with the middle hole of the SGP. If the fit is tight, be sure to sand the bottom of the drive gear where supports were generated and be sure to completely clear supports out of the SGP. You can also benefit by sanding the outside of the round part of the drive gear. Add graphite if available! -Check if drive gear fits by inserting the drive shaft into the SGP, lining up the grinded side of the drive shaft with the flat of the drive gear. Twist to check for tight spots. If you used graphite, the spots that rub against each other will actually leave black marks on the part that you can sand smooth. -Chances are the tolerances of the tiny holes on the very end of the side pins of the SGP are too small. To fix this, heat your paperclip (or whatever you're using as a pin) over a lighter for a few seconds. Then use the heated pin to push the holes through the side of the shaft that sticks out of the side of the SGP. -There are two reactionary gears. Fit the one with the smaller inner gear onto the side of the SGP with the support block, making sure the support block runs between the inner and outer teeth of the reactionary gear. -Repeat above two steps for the other gear on the side of the SGP without the support block. -Fit the nut into the hexagonal hole on the backside of the extruder set-screw block. -To make sure the the nut is fully set, use a blunt object (Hammer works fine.) to ensure a tight friction-fit (or glue if necessary. If your nut doesn't fit snuggly, redesign file based on your own measurements, or use gorilla glue which expands). -Test fit by screwing the bolt into the front of the set-screw block. Set aside for later, as the set screw block will be glued into place in final assembly after paint. -Cut a section of coat hanger and bend into shape as seen in photo. -Fit wire section into holes in the top inside of the winglets. Bend slightly at point specified in photo. Now you've got the mechanisms finished, time to install the electronics that make this thing run! -Solder switch to the schematic above. It is essentially a glorified "H-Bridge" in order for the motor to spin in either direction. The two center pins should go directly to the motor, the top-left and bottom right should be positive (red), and the bottom-left and top-right should be negative (black). Top-left and bottom-left should go to the battery. Give yourself more than 5ft. of wire from the switch to the battery to play with. -Solder (approx 1.5ft) wire to the switch. Match black to black and red to red. Will be eventually soldered to the motor. -Drill/Make a hole in the 1in. PVC pipe about 4in. from the end. -Fit switch into hole drilled into pipe, making sure to feed the 5ft length of wire all the way down to the other side to connect the batteries. Leave the shorter length of wire out the front. To help put the switch into place, Cut an arbitrary diagonal into the pipe above the switch to decrease the distance to insert the switch into the pipe. To connect all the batteries together, we used very small magnets (pictured above) to hold them together in the staff. -Connect four C-cell batteries together end-to-end as shown above. -Solder the positive and negative end of the wire coming from the switch to magnets. Each end will go to its respective side of the battery. -Use tinfoil (or that piece of biscuit tin we use in the photos) to reach the negative side by sandwiching it between two magnets. This sandwich connects to the bottom of the stack of magnets. Tinfoil should run along the side of the rest of the battery stacks. Then, make another sandwich with the negative magnets at the top of the stack. Wrap the top negative parts in duct tape or electrical tape to ensure no shortages. -If using the biscuit tin method, fold the end of the strip and add magnets. Put your stack of batteries onto the tin, having the negative side attach to magnets of folded part. You can then solder the negative wire directly to the exposed side of the metal strip above the positive terminal of the stack. Trim wires to ensure no shortages (does not matter if positive magnets accidentally stick to negative terminal, as positive and negative side of batteries not shorting). -Fit inside the bottom of the pipe, using the Pommel to keep it in. Now if you are planning to paint/finish this staff, then you will want to do the steps listed below. NO MECHANICAL PIECES SHOULD BE PAINTED. -Fill gaps, holes, and scars with wood filler. Sand smooth. -Mask off or use PVC pipe to block any pieces that have holes for pipes, as filler primer will make holes smaller and parts not fit. -Spray parts with 2 coats of filler-primer. -Sand with 220 grit until somewhat smooth. You'll most likely go through multiple sheets. -Repeat spraying with one coat and sanding until acceptable surface finish is achieved. -Work up the grits to 400 max (for the smoothest of smooths). -After final sanding, spray 2 thin coats of regular, flat primer. To paint the main pipe, mask switch and sections at ends where the pipe slides into the handle/pommel. Spray paint on black. To get the paint to stick better, sand pipe with 220 grit (optional). Add layer of clear coat as usual. Use at least 2 layers of acrylic paint to properly cover each part. Every part listed in priming and sanding should be painted. After a satisfactory paint job is acquired, apply a layer (or two) of clear coat. Step 9: Final Step... Put It All Together! You've gotten this far, now it is time to put your staff together. Gather all your parts and materials together and follow the directions/pictures for assembly. -Start by feeding the wire from the switch through the handle, guard, and 3/4 inch pipe cut for the motor adapter. Then, insert the pipe into the handle through the guard. Make sure the notch cut for the wires lines up with the hole for the wires in the handle. -Solder wires to motor which is inserted in the motor adapter. -Fit motor adapter into end of pipe. Just squish wires in. No biggie. -Fit bottom housing over pipe. Be sure that motor shaft fits through to the other side. -Insert shorter length of 1/2 inch PVC pipe all the way into the bottom housing. -Insert drive shaft, fitting shaft adapter over motor shaft. -This part is tricky. Fit a shaft reactionary gear into short barrel, but push it in such that its a little lower than the end of the short length of 1/2 in PVC pipe. See picture for more detail. -Insert the SGP with the drive gear facing up. Add second length of 1/2 inch PVC pipe to the other end. You may want to try to turn on the motor to test how well the gears connect. If they don't work well, check previous step. -Slide second shaft reactionary gear onto pipe. Slide long barrel onto it, pressing it against the SGP to engage the gears. Slowly slide long barrel farther down until clearance is enough that the barrels are close but not touching. -Slide rail plate over pipe, again leaving space for the long barrel to turn and not rub against it. Mark pipe through hole, then drill hole where marked. You can then turn a screw into both holes, locking the rail plate into place. Slide the dovetail rail into place, hiding the screw. You can then rotate the rails to align with the rest of the staff. -Trim the long 1/2 inch pipe 46mm above the top of the rail plate. -Fit sliders into the side of the extruder, sanding where necessary. Glue the set block into place in side of extruder as well. Do the next steps for one winglet at a time. -Fit wire hook attached to the top of the winglets to the slider clips. -Screw set screws into right side hole of extruder branch. Do not tighten yet. -Align holes of winglet and extruder by pushing winglet up near the top of the extruder. Then push a nail through the holes. Trim at the sharp end. Skip for winglet covering the set screw block. -Push sliders up as far as possible so the winglets stick out. You may want to have the extruder upside down for this step to let gravity swing the winglets out. Then, tighten the right side screws to lock winglets in outstuck position. To unfold winglets, loosen right side screws and push winglet down, then retighten while the slider is in its lower position. -Slide extruder (with winglets) onto the 1/2 pipe, adding graphite if available. Align set screw block with the flat side of the drive shaft. Then tighten set screw block bolt onto the drive shaft. -Add pin joint to final winglet, swing winglet out, then tighten right side screw to lock into place. Once all winglets are set in place, the staff is done (at least the outside)! Holding it vertically, turn it on and see how well it turns. If it is catching or juttering, you may need to disassemble and sand pieces such as the inside of the reactionary shaft gear, the SGP, the ends of the barrel, or the inside of the extruder. Add graphite anywhere there's a potential source of friction. For footage of the staff in action at MAGFEST 2017, check out this video and other videos on the channel. Thanks for this amazing design. Quite the daunting task for my first break into Cosplay. However, I am nearly done. As I'm dry fitting the parts together, I noticed the Rail Plate in your picture vs the Rail Plate in the files has a different diameter hole. The one in the file will fit the D-Shaft, but your instructions have you attaching the Rail Plate to the PVC core. DO you have an updated .stl file for this part? Or did you drill the hole larger? This is a great build! I'm currently in the process of 3D printing the pieces out and I was curious as to what program you used to modify the Static version of the staff? I have access to a printer large enough to print the Winglet as a singular piece and would like to try it like that. I used meshmixer to edit the existing files from obsidian props. Lots of hole and plain cuts. It worked out alright, but it would have been a much easier process if I designed the files myself. I'm working on the next version in Fusion 360 from scratch, and therefore there may be a better version coming soon. Good luck! Any idea what's going wrong? I hope this comment posts too...instructables is giving me a hard time. When I was making the files, some of them were edited from STL's downloaded from the original modeler (https://www.myminifactory.com/object/mercy-s-staff-22079). The STL's were edited through MeshMixer to make holes and do various plane cuts. It looks like the problem lies within intersecting shells conflicting with your slicer. I didn't have too much of a problem with this using Cura, but I did when I was using Craftware (which is why I went to Cura). As a fix, you can either try to redesign the file which can be a bit more tedious or try using a different software. There will be a Mercy staff update sometime over the summer when I have more time to work on it. Thanks! Your costumes and props are great! Thanks for sharing. 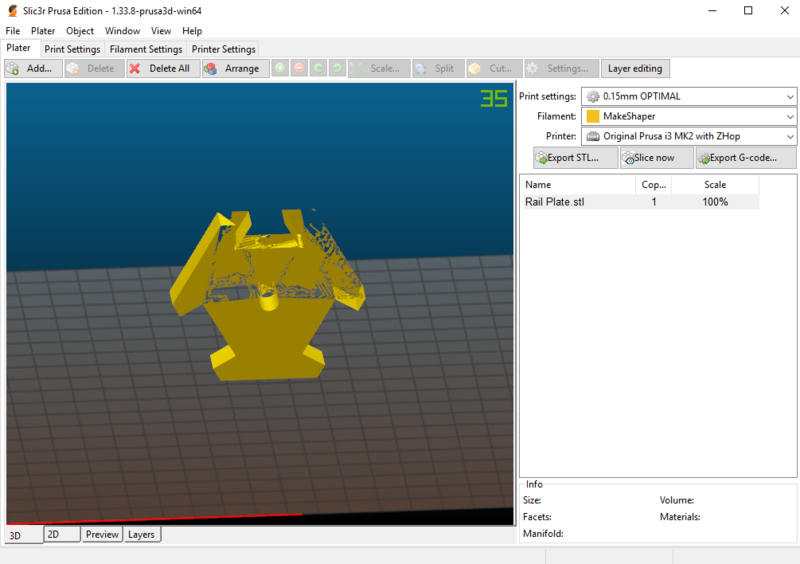 @Engineer_Corwin do you have the stl file for the Motor_Adapter because it seem's to be missing from the download zip. Many thanks. Apologies! New zip file now should have all mentioned files. We wish you luck building! Just updated that. NOW it has everything. We appreciate your patience! So far it's going well, used carbonfil for the gears and just using pla for the rest. Looks great! If you experience gearing issues and have a dubious amout of patience, I will be working on the 3rd version of the mechanism this summer that should hopefully reduce strain from the gear box. Do not have an ETA, but it will hopefully be done and on instructables on the account of this reply. Thanks for the feedback! Don't know how we screwed up there. Updated ZIP file is now up which now includes all files mentioned. Good luck! I'd love to see a video of this thing moving. Kassandra does wear it well wish she wasn't so afraid to smile. Staff looks great moving neat how it spins two different ways to give it the same appeal as the game. Glad you liked it! We put a lot of effort into making this.